Riding and maintaining your road bike can be easy with some basic maintenance and by practicing the right skills. Plus, while you ride your bike, you should do everything you can to feel comfortable. That includes the right fit, the right clothes, and above all else, the right touch points. Touch points on a bike are anywhere your body touches the bike (specifically hands, feet, and saddle). The easiest touch point to freshen up on your road bike is the bar tape. Read below for a step by step instruction on installing bar tape. The first choice you have when wrapping your bars is, will you wrap from inside out, or outside in? Either choice is fine as long as you start from the bottom of the bar rather than the top. Wrapping from the top down, will position the edge of the bar tape so it easily unravels with normal use. The bars on the left are being taped from inside to outside, while the ones on the right are going outside to inside. To begin. position the end of the bar tape about 50% off the end of the bar. While holding the end of the tape tightly, begin stretching the tape and winding it around the bar. When winding it, make sure that each section of tape, covers 25% of the previous wrap. It is important to stretch the tape. While most bar tapes have an adhesive backing to help hold itself in place, stretched tape will constrict around the bar as you wrap it, and stay in place better. While winding the tape up the bar, the only real difficulty is the brake hoods. First thing you want to do is flip the back of the brake hood forward, exposing the hood clamp band and a portion of the hood body. The most common ways to wrap around the hood are either, maintain the standard, spiral, winding pattern, or wrap the lever in a figure 8 pattern. For a standard wrap, first place a small piece of bar tape to cover the clamp band, then continue wrapping up the bar. For the figure 8 pattern, start winding as normal, once the tape gets over the hood, wrap the tape back down the side of the hood winding it around the bottom of the hood and crossing the tape in a figure 8 pattern across the back of the hood strap. 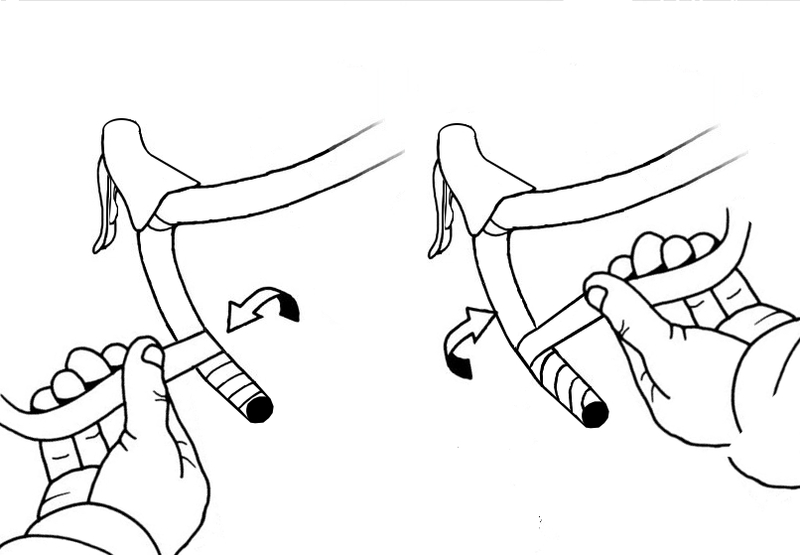 You have done it correctly if no bar is showing once you flip the brake hoods back into place. Once you have taped up the bar, past the hood, and are about 2” from the stem clamp, it is time to finish the tape. Most bar tapes come with vinyl finishing tape to hold the tape in place. Whereas bar tape is quite flexible finishing tape is a lot more ridged. When cutting the bar tape, cut it on an angle so that when wrapped, it leaves a sharp flat edge. Before using the finishing tape, I find it helpful to use a vinyl electrical tape to secure the bar tape, then wrap the supplied finishing tape on top in the opposite direction. When you have finished taping, go back to the open end of the bar, tuck any spare tape into it, and tap the bar plug into place. An easy sign of a good tape job is a clean finish and bar plugs that face upright. It’s O.K. to sweat the small stuff! Before you begin taping the bar, be sure to have scissors, electrical tape, a small section of bar tape, and the bar plug within reach. There is nothing more annoying than getting to the top of the bar and having to let it go (unraveling the bar) and go get scissors or tape. If you want a little more cush, take some spare bar tape and run it length wise along the top of the bar all the way to the hood and wrap over it. This method gives you added padding without increasing the bar diameter too much. If you want to change the profile of the bar you can use some spare brake housing under the tape to give the bar more of a wing profile. Simply secure it in place with liberal amounts of electrical tape. 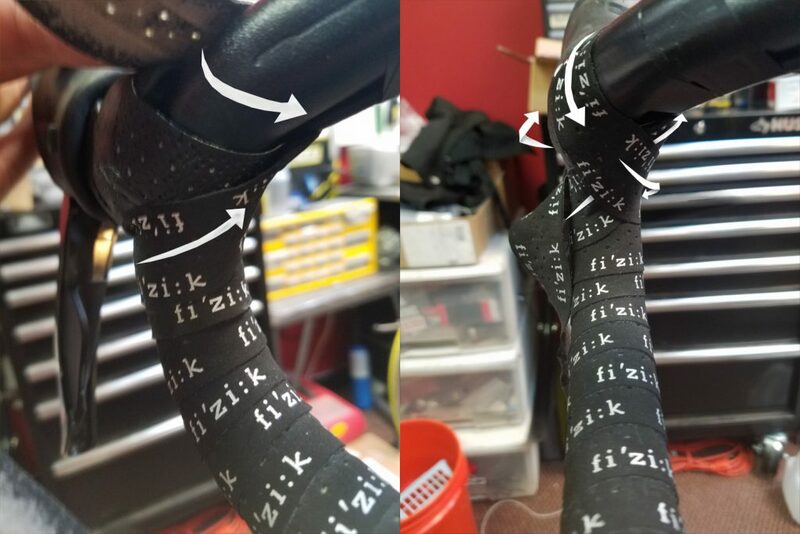 Hopefully by following the above instructions your new bar tape will go on quickly and neatly. However, if you don’t have the time or feel uncomfortable visit your favorite bike shop and they can get the feel your looking for. This entry was posted in News and tagged #fizik, #mtb, #nextbikeadventure, #roadbikes, #roadbikesoffroad, bar tape, bar tape instruction, Bartape, cinelli, comfortable riding, cross bike comfort, cross bikes, hand discomfort, how to, how-tos, instruction, riding discomfort, road bike comfort, road bikes, road bikes off road on July 27, 2017 by John Brown. Do you want to make your bike ride more fun? How about getting all you can out of your bike? What about making your bike more comfortable? Well, we have is some great news! We have compiled a list of simple bike tips to make your ride more fun, more efficient, and more comfortable. If your chain isn’t running smoothly, neither are you. While a in-depth bike clean is great, simply keeping your chain lubricated is an easy way to ensure you bike runs well. Start by propping the bike up so you can rotate the cranks backward freely. Next, Backpedal the bike, while dripping lubricant onto each chain link. 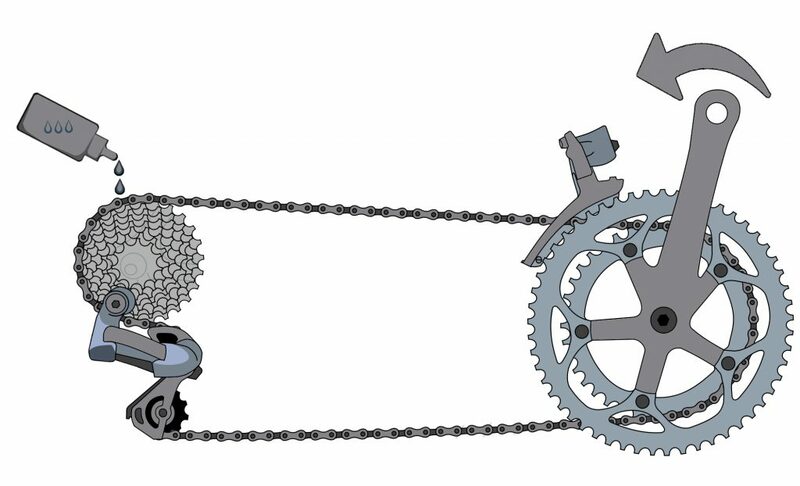 Once the chain is well saturated, give a few moments for the lubricant to penetrate the chain. Finally, wrap a rag around the chain, backpedal, and remove all the excess lubricant. Done! First, fill the tires to the recommended maximum pressure as listed on the sidewall. Next, take the bike for a quick spin around the block for feel. From there, let about 5psi out of each tire (a digital pressure gauge works great) and ride it again. Continue lowering the pressure in 5psi increments until you can no longer feel the small imperfections in the road vibrate through the bike. Use these pressures as you starting point. Finally, over the next few rides, adjust pressure by 2-3 psi in search of the absolute perfect pressure. The goal is for a pressure that allows the tire to easily deforms over objects, offer ample traction, and resist compressing too far under hard braking and turning. As an example, I recently determined my mountain bike’s perfect pressure to be 28psi for my front and 32psi in the rear. Checking your saddle height is also a quick way to get more comfort and efficiency. While a complete bike fit does the most benefit, checking saddle height goes a long way to help with back pain and other discomforts. 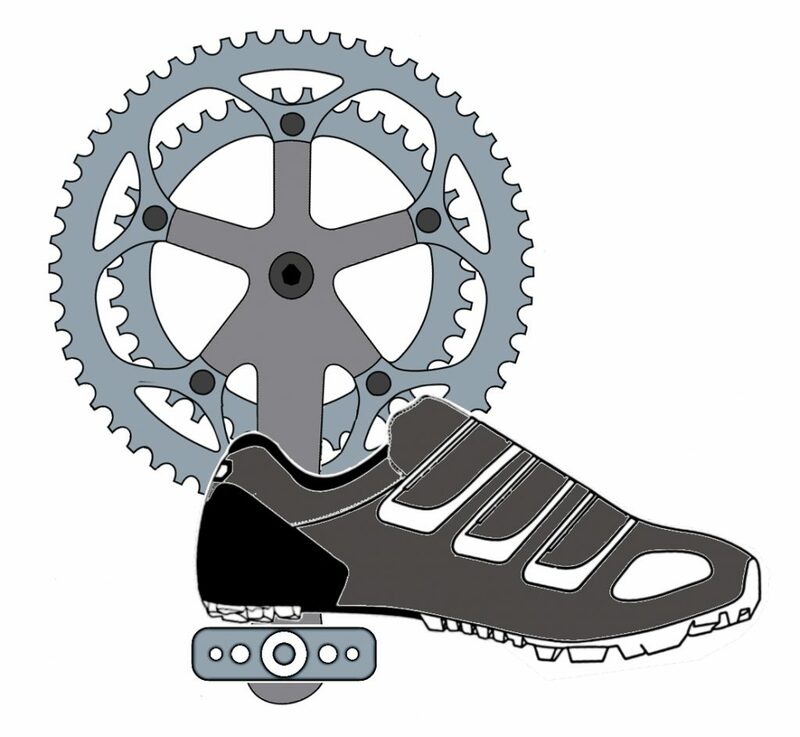 To set saddle height, sit on your bike and place your heel on your pedal. Then rotate the pedals backward. At the bottom of the pedal stroke your goal is to have your leg completely extended while keeping your hips level. If at the bottom of the pedal stroke you aren’t getting complete extension, raise your saddle. However, if you’re tilting your hips at the bottom of the pedal stroke, lower the saddle. Once you begin pedaling naturally (with the ball of your foot on your pedal, rather than your heel), you will have the proper amount of bend to your knee. To get your Mountain bike working it’s best try a few of these bike tips. Bicycle companies usually install all the same width bars on their mass-produced bicycles. That means that all but the largest size riders usually ride with bars that are too wide. For many riders, uncomfortable bar width is something they just get used to. But before you get used to it, realize that there are serious ramifications on using a bar that’s too wide. First, riding a bar that’s too wide spreads your arms out forcing you to use your support muscles inefficiently. Second, as you spread your arms, your back will naturally pitch forward (potentially leading to discomfort). Finally, wider bars are more prone to accidentally clipping trees or signs, causing a crash. 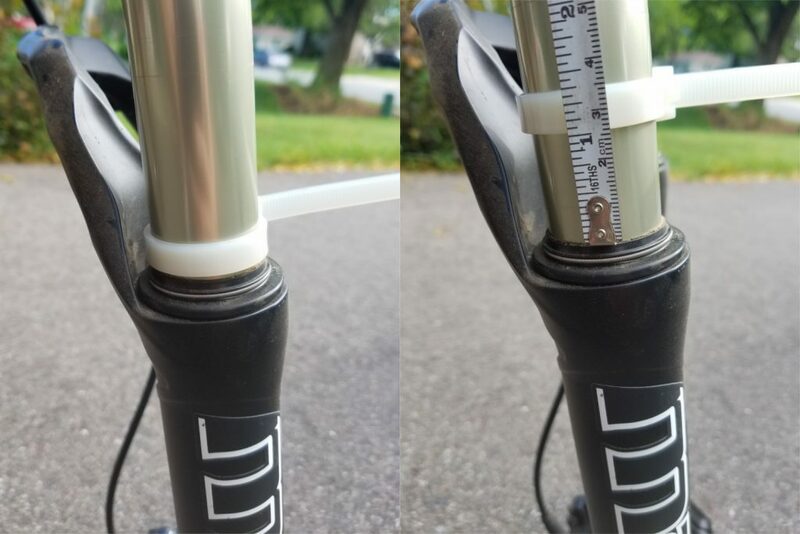 To cut your bars, first remove the grips (Spray a little hairspray under the grip and they will slide right off), Then measure and mark the amount of bar you intend to remove. Considering you can’t uncut your bars, only take 1-2 cm off at a time, then ride for a few weeks to verify before cutting again. You can cut the bars with a pipe cutter or hacksaw, but remember to smooth the sharp edge with sandpaper once finished. Stopping the bike confidently leads to control and comfort, so make sure you adjust your brakes levers to match the size of your hands. 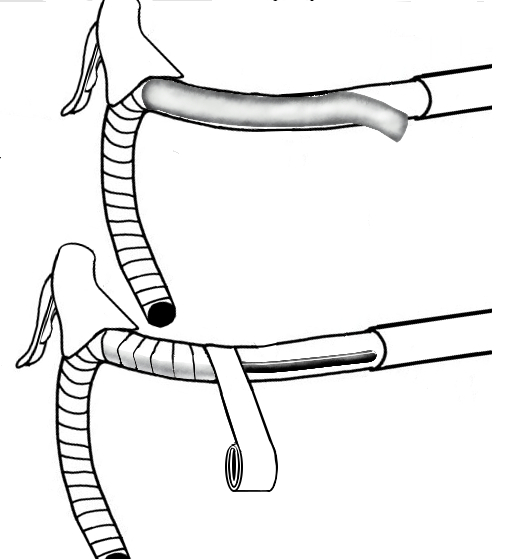 Most brake levers have a reach adjustment built into them. By loosening or tightening the reach adjustment bolt you can bring the brake lever closer to the bar, or move it further away. I like to setup a brake so that the rider can easily reach the lever without changing their hand position on the grip. Additionally, I try to make sure the levers can’t hit the bar, or other fingers when they are squeezed. A mountain bike with a suspension fork will work better once that fork is adjusted for the weight of the rider. The first step in adjusting the suspension is to set the “sag”. “Sag” is the amount your suspension compresses when you put your weight on the bike. Most suspension calls for about 25% sag, meaning, when you sit on the bike, the suspension compresses ¼ of its travel. To set sag, first snug a zip tie around the upper leg of your suspension fork. Make sure it is snug enough to stay in place by itself, but not actually tight. Slide the zip tie all the way down until it is resting on the rubber seal of your fork. Next, find somewhere that allows you to put both feet on the pedals and balance without needing to pedal (I find a wall works well). Get on the bike, rock back and forth a few times to cycle the suspension, then sit still on the saddle in your standard riding position with both hands on the bar. Have a friend, move the zip tire so it sits on the seal once again and carefully get off the bike. You can now measure the distance from the seal, to the bottom of the zip tie and determine your sag. As an example, if a fork has 100 millimeters of travel, you want the distance between the zip tie and seal to be 25 millimeters. If you would want to adjust your suspension, see your forks owner’s manual for details. Not to forget the road bike out there. Here are a few bike tips for the drop bars. On your road bike, bar tape does a big job. If installed correctly and replaced frequently, it can quiet loads of road buzz that would otherwise be transferred into your hands. 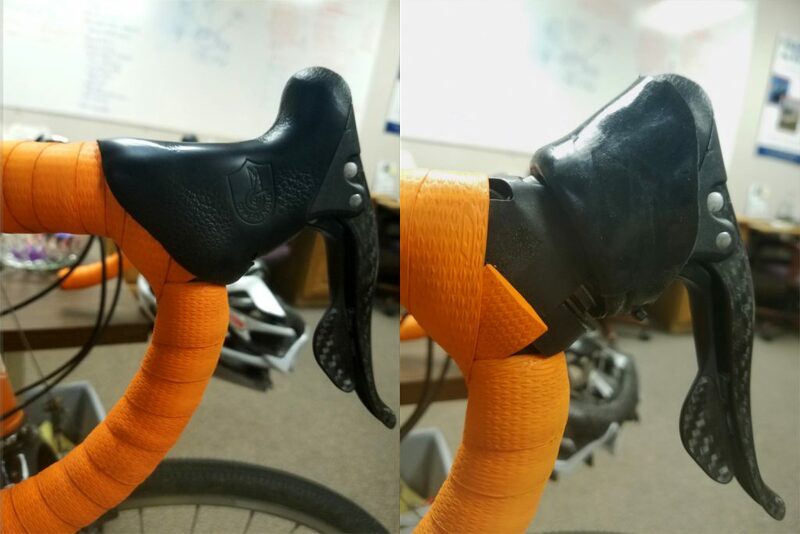 Many times, riders ignore their tape because it appears OK. While your tape may look OK, the real test is to see how compliant it is. Use the tip of your finger and press firmly into the tape where your hands typically rest (usually, this is just behind the hoods). Follow up by then pressing an area of the bar that never sees wear. Compare the two to see just how compressed your tape has become, replace if needed. While you are replacing your tape, it’s a good Idea to review the location of your brake hoods. Verify, that when seated on your bike with your hands on the hood, your wrist is straight. If your hands bend upward or down, you are putting excess strain on your shoulders, arms and hands. That strain can lead to fatigue or pain. Overall, a great fitting and functioning bicycle will allow you to ride longer, faster, and in more comfort. If you have additional questions about customizing your bicycle the professionals at your local bike shop can be a great resource. 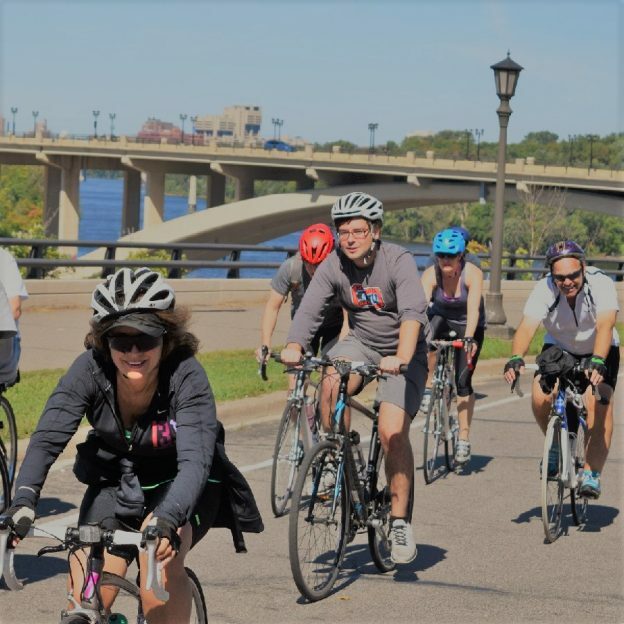 This entry was posted in News and tagged #nextbikeadventure, bar tape, Bike repair, bike tips, Bike tire repair, bike tricks, hybrid bike, Minnesota Bike Guide, mountain bike, road bike, sag, suspension sag, suspension setup, tire repair, tricks on June 9, 2017 by John Brown.